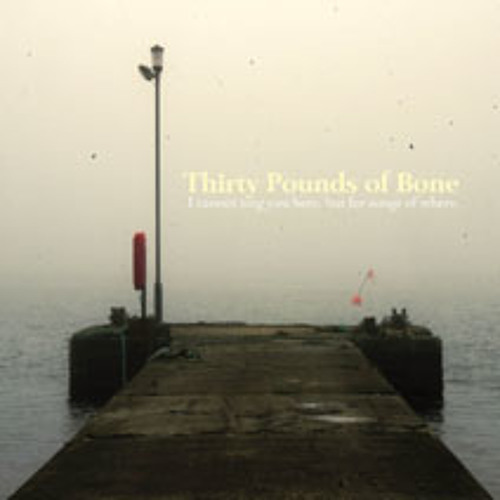 THIRTY POUNDS OF BONE - HOME FARING FREE DOWNLOAD SINGLE TAKEN FROM THE ALBUM 'I CANNOT SING YOU HERE, BUT FOR SONGS OF WHERE' RELEASED ON MONDAY 6TH MAY 2013. The son of an ordained clergyman, Johny Lamb (aka Thirty Pounds of Bone) was initially raised on the Shetland island of Unst; he’s always been fascinated with the sea and the fisheries. He has lived all over the British Isles, and has toured extensively throughout Europe. His life revolves around folk music and he believes strongly in innovation and change in traditional music rather than preservation of repertoire, as “a museum piece cannot be a ‘living’ tradition.” "Home Faring" is the first song to be lifted from the new album, 'I Cannot Sing You Here But For Songs Of Where', the follow up to 2010's 'Method'. The new record sees Johny further explore his continuing theme of place. Split into four separate locations; (past place, the place of heritage, present place and the in between), the record aims to articulate experiences of itinerancy and second-generation migrancy. The album is released on Monday 6th May and is available to Pre-order on CD from http://thirtypoundsofbone.bandcamp.com/album/i-cannot-sing-you-here-but-for-songs-of-where. I've heard their song The Street I Staggered Down six months ago and still remember the rhythm. But cannot find the track on SoundCloud, hope you can have one!